Microsoft's launch of Office 365 has Google feeling pressure to explain why Microsoft's general launch of its cloud-based Office 365 product today heralds an all-out assault on Google's effort to undermine its dominance of the office productivity apps. Microsoft's general launch of its cloud-based Office 365 product today heralds an all-out assault on Google's effort to undermine its dominance of the office productivity apps. Google Apps is the key market force in driving Microsoft to offer online-only versions of its Exchange, SharePoint, Lync and Office Productivity products, and while Google has claimed some high profile customers, it still hasn't significantly cut into Microsoft's office products market share. In an effort to justify the value of Google Apps against the new Office 365 product, the Shan Sinha, Google Apps product manager has written a blog post titled "365 reasons to consider Google Apps." Sinha was the founder and CEO of DocVerse, whose technology was acquired by Google and replaced with Cloud Connect for Microsoft Office, which brings Google's online collaboration features to standard versions of the Microsoft product. Coincidentally, Sinha also previously worked for Microsoft in SQL Server and SharePoint product strategy from 2004 to 2007. While Sinha wasn't able to list a full 365 reasons to consider Google Apps, he used his blog post to stress Google's completely browser-based approach to productivity software, which he believes is more conducive to collaboration. While Office 365 lets customers host Exchange, SharePoint and Lync servers in Microsoft data centres, the browser-based versions of Word, Excel and PowerPoint don't have all the capabilities of the on-premises version of Office. "Office 365 is for individuals. Apps is for teams," Sinha writes. "Most of us no longer spend our days working on our own. We work with others: creating, collaborating, sharing. With Apps you can work with multiple people in the same document. ... You can see people type in real time, and share a file in just two clicks. Discussions bring people into your documents for rich conversations. You don't need to buy additional licenses to work with others, or hope people outside your company have upgraded to the same software. If you have a Google account, you can collaborate." Sinha also published a chart showing a list of features Google offers that are either missing from Office 365 or require pricier plans. 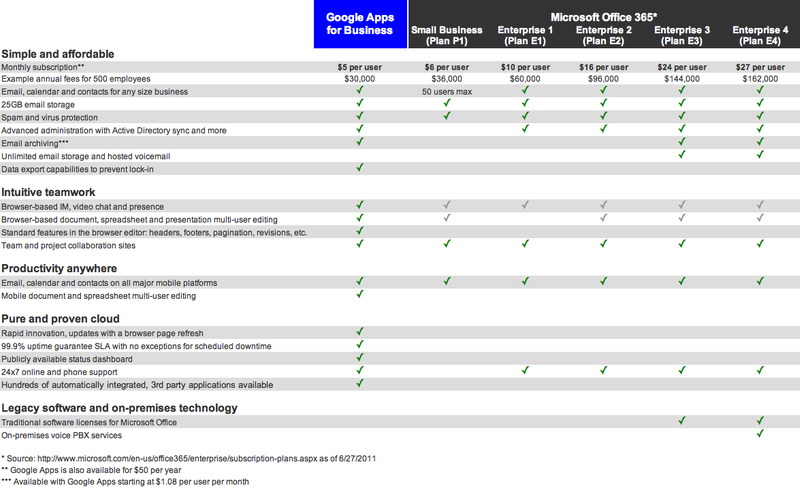 While Google Apps costs $5 per user per month (or $50 per year), Office 365 starts at $2 per user per month for just basic email, moves up to $6 for a small business package and up to $27 per user per month for an enterprise option that includes all the online offerings plus the non-cloud Office Professional Plus. Some of the Google features that aren't included in any version of Office 365, Sinha writes, are "data export capabilities to prevent lock-in" and multi-user editing of documents and spreadsheets for mobile users. While Google offers email archiving for an extra $1 per user each month, Microsoft customers have to pay at least $24 per user per month for a plan that includes that feature, he writes. Sinha acknowledges that some features in Office 365 aren't available from Google, including unlimited email storage and hosted voicemail, and an on-premises PBX voice system. "Apps isn't for everyone," Sinha writes. "But in the last week alone 38,000 businesses decided to give it a try. Maybe you should too." Google claims more than 3 million businesses use Google Apps, and the company just launched a line of Chromebooks, Web-only laptops that don't require Google Apps but may be effective for Google Apps customers. Microsoft's publicly stated numbers are a bit higher: 750 million active users of Office, and installations on 1 billion PCs, although Microsoft doesn't detail how it arrived at those calculations. Microsoft CEO Steve Ballmer is scheduled to talk to press in New York City today to announce the launch of Office 365. Microsoft is likely to argue that it's better suited than Google to providing a full-featured and secure office experience, whether in a customer's data centre or in the cloud. But there's room in the market for both, and Google has won some converts. Sinha hopes Google's cross-platform capabilities will win some more. "Office 365 is optimized for Windows-based PCs and devices, which reduces your flexibility," Sinha argues. "Our applications are designed to work well on any device, on any operating system. Desktop, laptop, Chromebook, tablet, smartphone. Windows, Mac, Linux, Android, Blackberry, iOS, Windows Mobile."